Man, 26, Dies After Crash On Florida’s Turnpike In West Palm Beach | Schuler, Halvorson, Weisser, Zoeller & Overbeck P.A. A 26-year-old man died after crashing his vehicle on the Florida Turnpike in Palm Beach County, a Florida Highway Patrol spokeswoman said. The crash occurred while he was driving northbound on Florida’s Turnpike near the Okeechobee Blvd exit ramp in West Palm Beach. 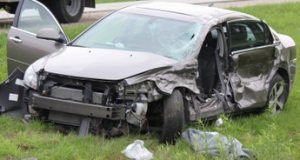 According to the FHP spokeswoman, the young man from Fort Pierce couldn’t get out through the passenger door of a Malibu that was struck by a tractor-trailer. First emergency responders arrived at the site of the crash soon after the accident happened. The victim was rushed to a nearby hospital, where he was pronounced dead on arrival. The semi truck was reported to have switched from the right lane to the left, striking the passenger side of the Malibu, according to an eyewitness’ report. The Malibu got lodged under the semi truck as both drifted off the road. The vehicles hit a guardrail and broke away from each other. The drivers sustained major injuries. This is a vehicle crash that ended with a death because a truck driver improperly changed lanes said the FHP. The cause of the crash is being investigated. Florida’s Turnpike is closed at the moment due to the severity of the crash. Vehicles on this route are pulling to the roadside to allow crews work. The delay of traffic right now heading northbound is over 5 miles long. It is best to use an alternative route such as I-95 or Jog Road. West Palm Beach attorney Jason Weisser of Schuler, Halvorson, Weisser, Zoeller and Overbeck responded about the crash. “Cases involving accidents with commercial trucks are always subject to heightened scrutiny. This is because of the additional regulations for the drivers of commercial vehicles. In our practice, we have seen numerous instances where drivers violate these regulations, which results in serious consequences. From the reports from the scene it appears that the driver of the tractor trailer was at fault. If you have been in an accident, make sure that you contact an experienced trial lawyer to represent you and your family”. The post Man, 26, Dies After Crash On Florida’s Turnpike In West Palm Beach appeared first on Traffic Center.